During one of our outdoor events the children attending enjoyed body and face painting with the artistic application of special water-based cosmetic “paints”. 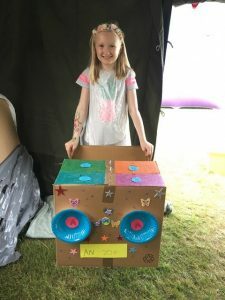 For many years Body and Face painting has been a popular activity for entertainment at fairs, festivals, open-air markets and other locations that attract children and adolescents such as our Pop up Campsite when we also hold private parties and events. Many teenagers and adults enjoy being painted for events, such as sports events or charity fund raisers. On the Saturday before Halloween and as part of cosplay practice, face painting is also enjoyed by many people who dress up as zombies to dance as part of the worldwide “Thrill the World” event. It is a reasonable assumption that humans have painted their faces and bodies since the very beginning and for many reasons including hunting and body adornment. Neanderthals had the tools and skills for face painting; although no longer considered a direct ancestor of homo sapiens, they lived alongside them in some areas. After the fall of the French aristocracy the practice died out in Western culture and re-entered popular culture during the hippie movement of the late nineteen sixties, when it was common for flowers or peace symbols at anti-war demonstrations to be painted on the women’s cheeks as decorations. During your stay at Pop Up Campsite or as part of your outdoor event we can organise a person to paint designs on your guests faces. 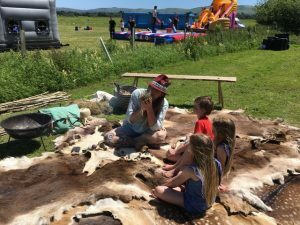 There are many local attractions and activities suitable for all ages at our Pop Up by the River, Pop-up Brighton and Pop-up in the woods campsites including Bushcraft skills, hiring canoe, kayak and paddle boards, ambling along the bidal path and local pubs such as the Fountain Inn at Ashurst. We also cater for special occasions such as weddings and can cater for all of your needs on the day through to the evening entertainment. We have plenty of beautiful outdoor space for all of your guests to enjoy a memorable experience. Our team building activities during outdoor corporate events are designed to incorporate problem solving and to improve communication skills as well as being exciting and fun for all of the participants involved and thus leading to excellent team performance for future achievements. We recently held a Corporate Day which included challenging activities such as an inflatable its a knock out and creative spaces for young people to achieve goals and learn new things such as Bushcraft Skills in an enjoyable way. There were refreshments and outside seating for everybody to enjoy after all of their efforts including ice cold cocktails and locally produced draft beers, ales and wines from Poosie Nancy Vintage horse box bar, bespoke pizzas served hot straight from the Camp and Deliver pizza trailer whilst the Boca Loca caterers who are in a class of their own having been finalists for the Sussex Food and Drink Awards provided a fabulous evening BBQ with locally sourced fresh food.